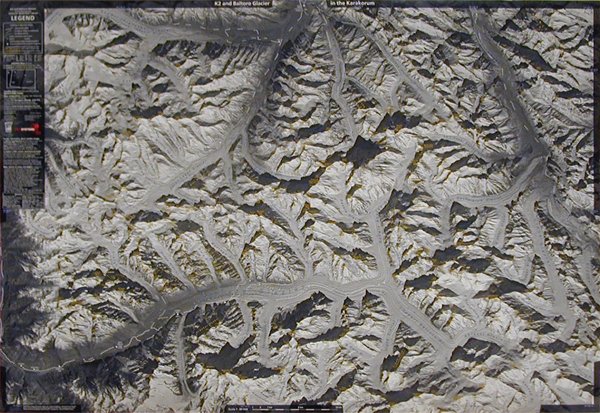 Stunning satellite image of the K2 and the Baltoro Glacier in the Karakoram at 1:80,000, produced by the Polish Mountaineering Association and annotated with names of peaks, glaciers and passes, numerous spot heights, trekking and approach routes, base camps and seasonal settlements. 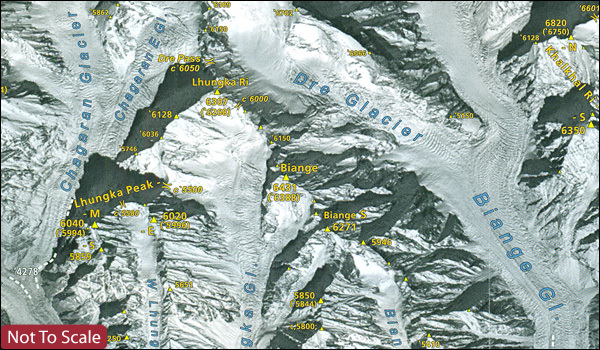 Centered on the peak of K2, coverage extends from the Sughet Jangal (‘Yinhongtan – Chinese Base Camp) southwards to just beyond the peak of Masherbrum, and west - east from the Dumordo River to beyond the Gasherbrum group of peaks. 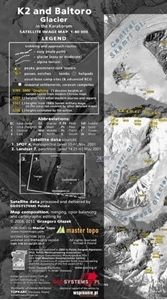 The overprint distinguishes between mule paths, easy or moderate glacier trails, and alpine routes. Peak heights indicate the sources from which they were taken. The map has margin ticks for latitude and longitude at intervals of 10’. All the text is in English and a glossary of main terms used in local names is also provided. The image, derived from data gathered by Spot 4 and Landsat 7 in 2001, was originally published in 2004 to celebrate the 100th anniversary of the Association and the 50th anniversary of the first ascent of K2, and is now available in a new 2nd edition, updated and revised in 2013. This title is also available as a wall map.